Ben Makin's aviation journey continues after receiving the Royal Air Force Charitable Trust Flying Excellence Award. This award gives Cadet Ben Makin £5,000 in flying lessons to further his career as a pilot. He already has his PPL (Private Pilot's Licence) from a previous scholarship but this opportunity will mean Ben can further his training by adding restricted instrument rating. This lets Ben train for more accurate flying and enables him to train in worse weather conditions. In his spare time Ben does some temporary flying work with the Tiger Moths to maintain a high standard of flying skills. Ben was given the award back in October 2017 and can clearly remember the day that he found out. "I couldn't really believe it! To be able to work with the Charitable Trust was incredible, I was so, so grateful to be given the opportunity. Really, really amazing!" said Ben. The trophy is awarded annually to an Air Cadet or CCF (Air) Cadet, who, having completed the Air Chief Marshal Sir Michael Knight Flying Scholarship, demonstrates excellence in flying skills, leadership and outstanding personal qualities. Air cadets compete nationally for the trophy, which this year was accompanied by a substantial flying bursary generously donated by Lockheed Martin. This bursary will contribute to developing Ben's piloting skills as he continues his journey towards achieving a Private Pilot's Licence. In the future Ben hopes to fly a Chinook and continue to live the military lifestyle. 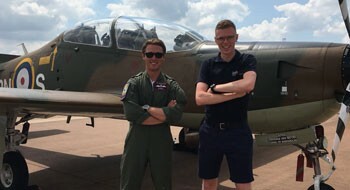 Previous Flying Excellence award winner Elliot Stark has gone on to big things after receiving his award and is now a qualified flying instructor. He spoke about how the award has helped him further his career and created lots of opportunities, "I was chuffed... It was really cool."